The general and administrative cost model is used to estimate in detail and then summarize the general and administrative expenses for inclusion in the income statement of the financial projections template. The costs form an important part of the financial projections operating expenses (OPEX), and are more fully discussed in our general and administrative expense post. General and administrative costs can be found in all businesses, and are those costs associated with the day to day operating expenses of a business which are not directly linked to product costs, or included in research and development or sales and marketing expenses. The type of costs to be included vary from business to business, and decisions need to be made at an early stage which costs to include under this heading. Typically general and administrative expenses include such things as salary costs for administrative staff, legal and professional fees, and office rent and insurance costs. The purpose of this general and administrative cost model is to help you accumulate the relevant costs in detail and summarize then ready for inclusion in the financial projections template. The general and administrative cost model which is available for download below, is used as follows. Enter the title for the staff position. The model should only include staff engaged in general and administrative activities for the business. For each staff position, enter the start month and the end month. The calculation of the staff cost assumes that the staff member starts on the first day of a month and ends on the last day of a month. So for example, is the start month entered is 1 and the end month is 18, then the model will show a total of 18 months of cost, split 12 months shown in year 1 and 6 months shown in year 2. Enter the annual year 1 staff cost for each position. This would normally be the gross salary for an employee. On-costs allow for all the additional costs of a staff member such as employer taxes, health care, life assurance, pensions etc. Enter a percentage which reflects the level of on-costs for the business. The percentage is applied to the staff cost before on-costs. Enter the expected annual staff cost inflation rate for years 2 to 4. The percentage is applied to the previous years staff cost. Once entered, the general and administrative cost model works out the total staff costs for each year taking into account the start and end months, base year one staff cost, and the on-cost percentage and inflation rates. The staff headcount is also calculated based on the number of position line items in use at the end of each year. To complete the general and administrative cost model enter a description and amount for each of the 5 years for each line item to be included under general and administrative. It should be noted that these amounts are entered manually and are not adjusted by the inflation rates previously entered, which apply only to the staff costs calculation. Finally, the model calculates the total costs for each of the 5 years. The amounts calculated should now be included under the heading of general and administrative on the income statement of the financial projections template. Our general and administrative cost model is available for download in Excel format using the link below. Users use this general and administrative expenses model at their own risk. We make no warranty or representation as to its accuracy and we are covered by the terms of our legal disclaimer, which you are deemed to have read. 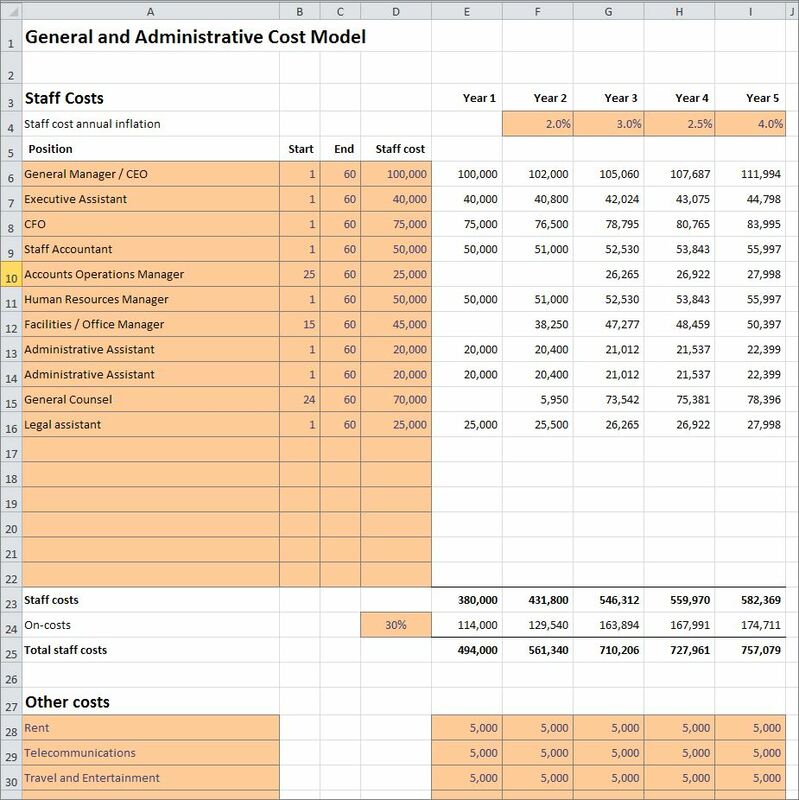 This is an example of a general and administrative cost model that you might use when preparing financial models in Excel. It is purely illustrative of a business plan financial model. This is not intended to reflect general standards or targets for any particular company or sector. If you do spot a mistake in this general & administrative operational model, please let us know and we will try to fix it.